Compiled by Elsa Wood and Jon Dunkelman, this field guide is the result of 2� years surveying grassland sites in the Lower Wye Valley by Monmouthshire Meadows Group. 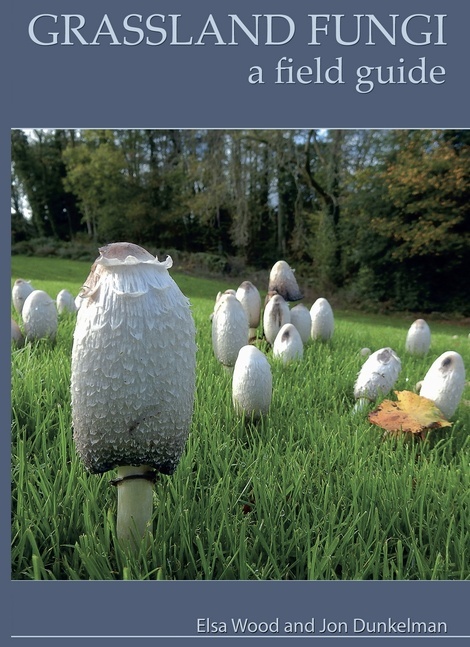 The vital role of fungi in the ecology of grasslands is becoming more widely appreciated, sparking an increasing interest in identification.This ﬁeld guide covers the species that are commonly found in meadows and other grasslands throughout the UK including the colourful waxcaps and many other fascinating species. It was compiled by the authors from surveys made for over 2� years in the Lower Wye Valley, by Monmouthshire Meadows Group. Photographs have been selected to illustrate the key identification points. There is an overview of the process of identifying fungi in the field, and while technical terms are kept to a minimum, those used are explained in the glossary. 177 species with clear descriptions of each, and over 800 photographs. Key indentiﬁcation points to help distinguish between similar species. Designed to be suitable for the beginner and amateur enthusiast, it will appeal to anyone with an interest in grassland mycology. Authors: - Wood, E., Dunkelman, J.